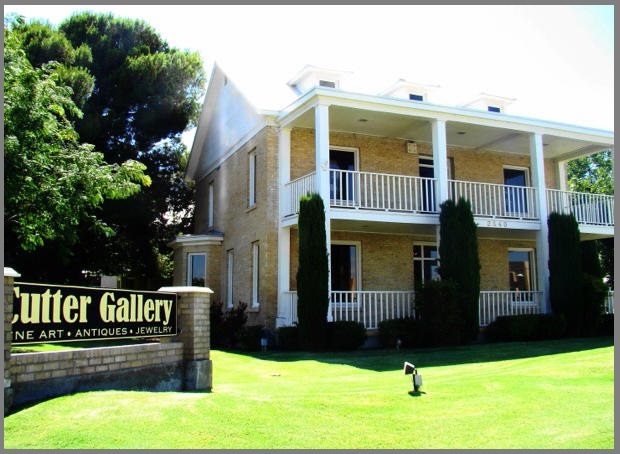 The Cutter Gallery is owned and operated by Glenn and Sally Cutter, who have served generations of discriminating buyers of Jewelry, Art, and Antiques. Along with work from 25 of the area’s finest artists, you will find pieces from nationally and internationally known artists. Browse through Antiques including estate silver, crystal, china, furniture, bronzes, and Native American and Asian objects. We also carry the beautiful Jan Barboglio line of decorative accessories. You will see both new and estate Jewelry as well as contemporary jewelry designs. We have a wide selection of jewelry including Engagement and Wedding Rings, earrings, bracelets, and brooches. Our designers will assist you in creating an original piece of jewelry, as well as redesigning your family jewelry heirlooms. We offer repair of jewelry, clocks, and watches. Appraisals of jewelry, art, and antiques, and consignment services are also available. The Gallery is in the historic Hadley House, built in 1906, located at the corner of El Paseo Road and University Avenue in Las Cruces, New Mexico.